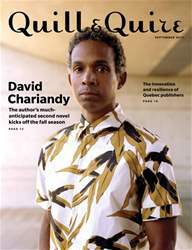 Digital Subscriptions > Quill & Quire > September 2017 > Say what? SPARE A THOUGHT for the country’s translators. In a nation that is nominally multicultural and officially bilingual, the diligent wordsmiths who devote themselves to rendering foreign language texts into the dominant English are rarely afforded the recognition or admiration they deserve. Readers who shy away from work in translation with the same disinclination they display in eschewing subtitled movies (too much work; clearly – literally – foreign to an anglophone’s primary experience) often fail to appreciate the difficulties translation can pose or the evident skill and finesse required to negotiate the subtle bridge between remaining true to an originating artist’s vision and furnishing a work in fluid, readable English. In some cases, the roadblocks are obvious (or should be). When the French oulipo writer Georges Perec produced La disparition (in English, A Void), a novel written entirely without using the letter “e,” he set his translators a devious challenge. (One that the canny Gilbert Adair admittedly fudges by presenting numbers –“cinq,” “huit,” “dix,” etc. – as a numerals, thereby avoiding the “e”s in the written English words.) Poetry – especially of the formal, metrical variety – provides another clear obstacle.